These decorative toasts are brilliant. With so many fruits being in season, the possibilities for toppings are endless. Check out some of our ideas below. 4 slices of gluten free bread. On a chopping board, chop the strawberries and 3/4 blackberries lengthways. In a small mixing bowl, add a large tablespoon of the mascarpone cheese and 2 fresh blackberries. Crush the blackberries with the end of a wooden spoon (like a mortar and pestle), and mix this. Set aside.In a separate bowl, add another large tablespoon of mascarpone cheese. Empty the cinnamon and cacao into this and 1 teaspoon stevia. Mix this evenly until it resembles a chocolate spread. Set aside.In another mixing bowl, place one large tablespoon of mascarpone and add the nuts and half a tablespoon of chia seeds, as well as half a teaspoon of stevia. Mix this. Set aside. Place the gluten free bread into a toaster and cook until golden brown. Place aside and begin decorating the toasts. 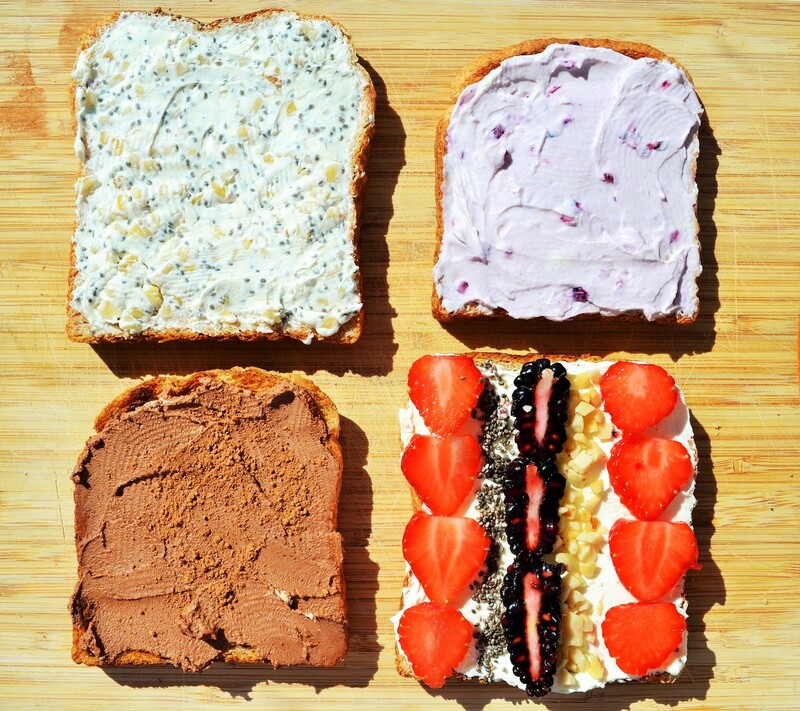 Each toast is as follows: the mixed nuts, chia seeds and stevia spread. The second is the blackberry and mascarpone spread; following this is the cacao and cinnamon spread. The last toast is simply mascarpone cheese decorated with the chopped strawberries, blackberries, chia seeds and nuts. Serve and enjoy.